From left, panelists speaking at the USAG Stuttgart’s Women’s History Month observance are Brig. Gen. Beth Salisbury, deputy commanding general, 3rd Medical Command; Kathryn McNeely, USAG Stuttgart deputy to the garrison commander; 1st Sgt. Shalonda Miles, Sergeants Major Course; and Ret. Brig. Gen. Arnold Gordon-Bray. There are two kinds of people, said retired Brig. Gen. Arnold Gordon-Bray: tokens and wedges. Tokens do something to be the first solely to do it, and wedges keep their feet in the door so that someone who may not have had the chance before may now come through. 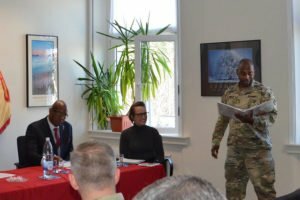 Gordon-Bray was one of four panelists at the USAG Stuttgart Equal Opportunity Office and Army Community Service’s Women’s History Month observance at Army Community Service, Panzer Kaserne, March 20. “It’s never just the affected group that is part of the solution,” Gordon-Bray said. The panel reiterated the theme to “be the wedge” throughout the program. Sgt. First Class Pierre Boynton, USAG-Stuttgart EO advisor, describes the achievements of American women during the annual Women’s History Month observance, March 20. 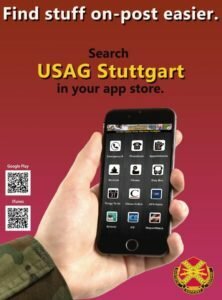 Garrison EO Advisor Sgt. First Class Pierre Boynton, opened the event explaining the importance of the annual March observance that honors and celebrates the struggles and achievements of American women throughout the history of the United States. The event pays tribute to women’s contributions and those continuing to pave the way forward. 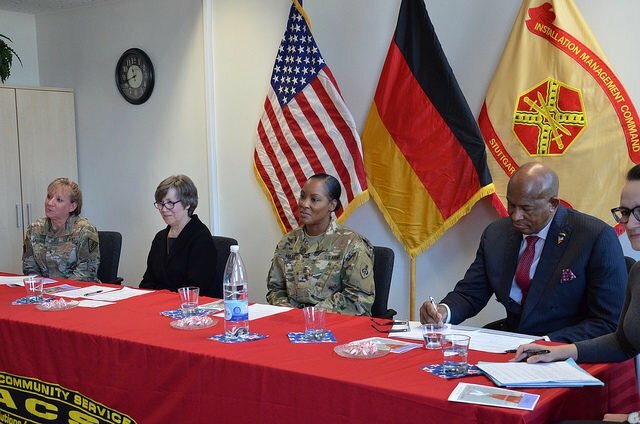 The event was moderated by Cori Fleser, Women’s Peace and Security Division gender advisor, J5, U.S. Africa Command. Fleser led a powerful line of questions related to the reasoning of each panelist to enlist the military or join federal service, as well as what changes they have witnessed or personally experienced through their careers. “I wouldn’t be here today if it weren’t for the people with me, who worked with me, surrounded me,” said panelist Brig. Gen. Beth Salisbury, deputy commanding general, 3rd Medical Command. Watch the full discussion filmed live by AFN Stuttgart. Note, due to being on Facebook, this may have to viewed from a non-government computer.